home | Local PC Windows based VoIP Call Shop System with displays. 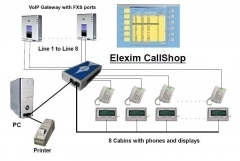 Provides the connection between the phone lines, phones and main module. Number of these modules must be equal to Your cabins. amount. When the phone is picked up and dials ,they show the dialed number and the conversation price and duration. After pressing the button, start display the price and simultaneously permits speaking through the microphone. Used additional telephone box to be included as the telephone line cord and the handset cord. The prices are based on the number of phone lines and the number of displays: line module - $ 20, display - $ 30, Base module - $ 30. You can made any combination of the number of phone lines and displays. The system is build of hardware and software and can be easy expanable from 2 to 8 phone lines with or without displays. Some phone booth customers prefer to talk through a cordless phone and they do not watch to the display. Therefore, you can buy less displays, than the telephone booths. The displays are connected by cable and can easily be added if needed later. We offer our billing system for free if you use our VoIP services! The price of the equipment will be returned after stop using ours services and return of equipment.